If you follow me on Instagram, you will know that I have forever been on the hunt for a protein powder that is not only Organic but also free of any harmful gums. 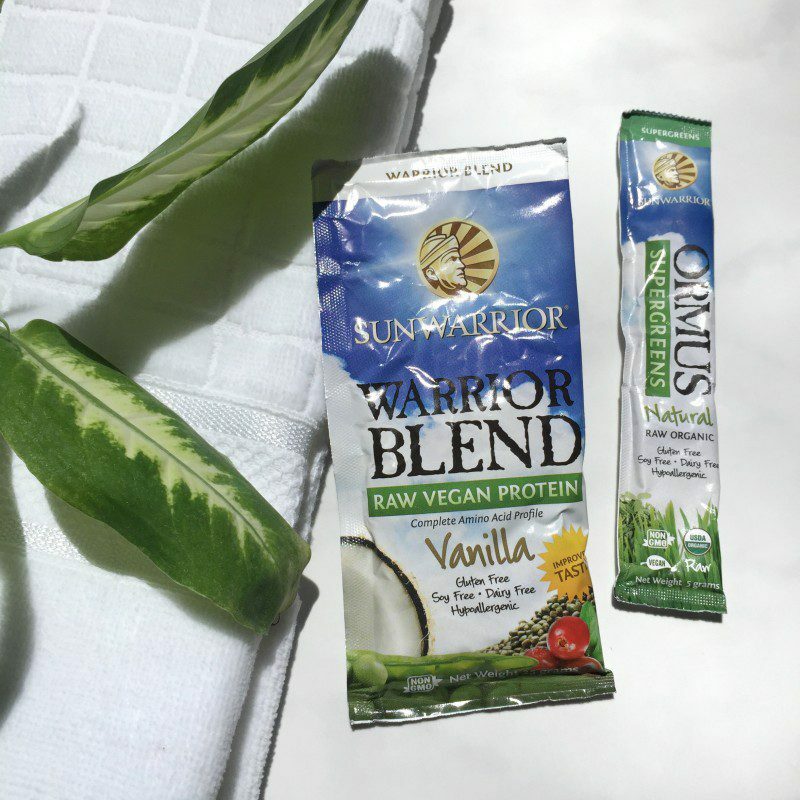 I recently learned that all protein powders have to have a stabilizer in them to be able to be in stores, however, I am also learning that there are some stabilizers that are better than others which is why I was happy to come across Sun Warrior “Warrior Blend” products which are almost entirely Organic and free of any irritating gums. The Original Classic Protein does contain Xanthan Gum, which is derived from rice, however, I prefer the “Warrior Blend” powders as those are the healthiest and most safe in my opinion, stabilized with Konjac Root and Fenugreek Fibers instead. Made with Organic, Raw plant proteins. Great for healthy weight loss, increased energy, mental clarity and metabolism. Free of solvents, GMOs, radiation, artificial flavors, artificial preservatives, artificial colors, animal products, dairy, egg, gluten, soy, added sugar, wheat, or yeast! Stabilized with Konjac Root and Fenugreek natural fibers. Made with up to 19g of Protein and 0g of Sugar per serving. As soon as I heard these protein powders were Organic, Raw and free of Xanthan Gum, I knew I had to try them out. Because I prefer to eat Vegetarian, these powders will be able to give me some much-needed protein to keep my body nice and balanced, especially for days where I am short on time. Before buying the larger containers of the powders, I tried samples of both the Vanilla and Chocolate to decide which I liked best. Because I prefer a drink that actually tastes sweet and delicious, I did add homemade Cashew Milk and Medjool Dates to my blends which made these much more enjoyable to drink. I honestly never like any protein shake just mixed with water in a shaker so I personally have to blend my shakes with a creamy nut milk and a splash of sweetness to make them yummy. I did taste a sip of the Vanilla with just water and the powder and it was ok, but I certainly suggest adding some milk and some sort of sweetness to them, fruit, dates, honey etc… for the best taste. These are a bit grainy also so blending them with other stuff helps make it smoother and more delicious. My favorite flavor was the Vanilla, mostly because you can do so much with it, adding in some berries for a berry flavored smoothie, some dates and banana for an ice cream like treat or perhaps some peaches for a peaches and cream flavor. With Vanilla, there really are endless combinations you can make so you never get sick of the same drink day after day. To help you make this super delicious, here is how I make and love mine! 8 Ounces of Homemade Cashew Milk or Nut Milk of your choice. The Chocolate was also pretty tasty as well , maybe even a better flavor on it’s own than Vanilla, but I really do prefer Vanilla so I can mix it up more. Also, Sun Warrior has tonsss of other great stuff to check out, lots of supplements, super green powders and fun kits, all Organic which is a great discovery for me because most of these supplement brands you see today are not Organic. When using supplements and powders daily, you really want to ensure you’re consuming all Organic because you are using it so often. The post Sun Warrior Organic Protein Powders appeared first on Organic Bunny.